Vegetarians and meat lovers alike will love these delicious tacos. Mushrooms provide a ‘meaty’ flavour, balanced out by sweet red onion. Heat half the oil in a large non-stick frying pan over a medium heat. Add the onion and cook for 3-4 minutes until softened. Add the rest of the oil and the mushrooms to the pan, raise the heat and cook, stirring frequently, for 3-4 minutes until tender and browned. Reduce the heat to low and stir in the taco seasoning mix and water. Cook gently for about 5 minutes, stirring occasionally. Meanwhile warm the tortillas as directed on the packaging. 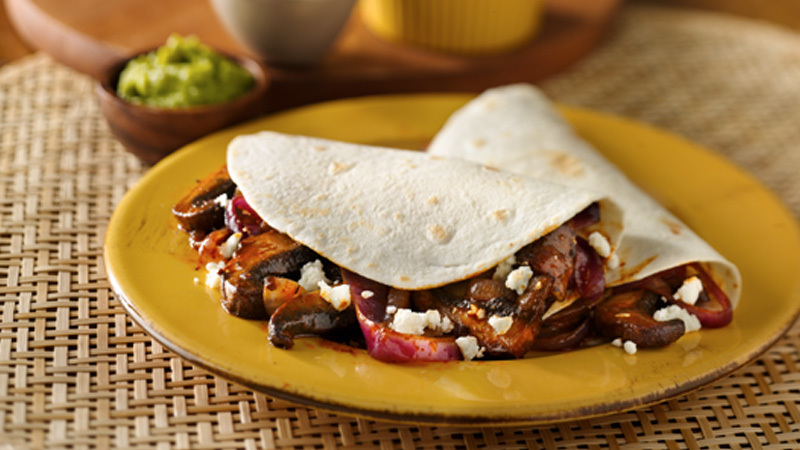 Divide the mushroom mixture between the warmed tortillas and top with crumbled feta. Fold and serve with guacamole and soured cream. Add extra protein to this dish by stirring in 100g tinned black beans or red kidney beans with the taco seasoning and water. Use a mix of different mushrooms, if liked. Why not try sliced chestnut and shiitake with some halved button mushrooms.